Grant of GP 66001- in PB-3 as 3rd MACP to-Nursing Personnel in Railways-reg. 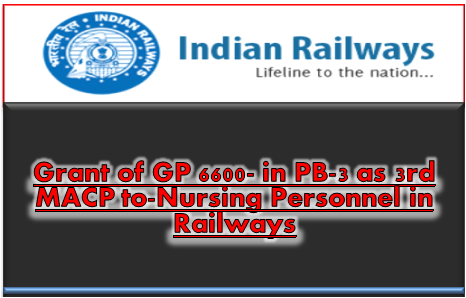 Sub: Grant of GP 6600/- in PB-3 as 3rd MACP to-Nursing Personnel in Railways-reg. (ii) Ministry of Health & Family Welfare's O.M. No. Z-28015/5/2016- N(Pt.) dated 09th September, 2016. (iii) NFIR's letter No. IV/MACPS/9/Part l0 dated 12/09/2016. (iv) NFIR's letter No. *IV/MACPS/09lPart 1l dated 12/03/2018. Federation is glad to inform the affiliates that the Railway Ministry has since approved for granting 3rd Financial upgradation under MACPS in GP 6600/- (PB-3) to the Nursing Personnel on Indian Railways in terms of Ministry of Health & Family Welfare's O.M. No. Z-28015/5/2016-N(Pt.) dated 09th September. 2016. It may be noted that orders are under issue.